[vc_row][vc_column width=”2/3″][vc_column_text]It’s been twenty-plus years since we were living knee-deep in the high hair, bright colors and big fashion of the 1980’s and 1990’s. Long ago are the days of the big perm, teased bouffant, blue eye-shadow and dark lip. The early 2000’s ushered in a new era of softer make-up. Nudes, pastels, taupes and apple-blossom cheeks took over the scene, helping to streamline an every-day look that made it seem like you were wearing no make-up at all. With the Y2K change in how we applied make-up and what we applied, we left behind an attitude that went with the large-and-in-charge make-up of the earlier decades. This also meant saying goodbye to the bold lip. The burgundy, violet, and hot red shades that draw attention to your face immediately upon meeting someone went into hibernation. But now, twenty years later, colors that tip the scale toward black, plum, mulberry and cherry are coming back, almost as aggressively as the colors themselves. [/vc_column_text][/vc_column][/vc_row][vc_row][vc_column width=”2/3″][vc_column_text]An elegant take on “goth-chic,” dark lip colors scream independence and courage. Who knew that this pigment held inside its 1oz tube could wield so much power? 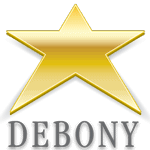 Every girl at the Debony Salon has her own signature style. We have Marissa with her wing- tipped eyeliner, Sarah Jette with her defined eyebrows, Tarmey with her platinum hair, Jen with her fancy dresses, Adina with her bangs ….and Jaimie with her dark lip. Feeling uncomfortable in anything less than a level eight on the volume dial of color, Jaimie walks around in a bold red lip, and lately has been circling her lips in a violet-black on any given day. And for all the reasons expressed above. “A dark lip makes me feel powerful . 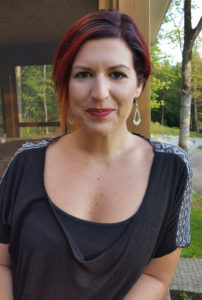 It makes a statement without me having to say anything,” Favoring Jane Iredale’s newest red color, “Cindy,” from the PureMoist line as well as “Annette,” and the “Fetish” lip gloss and stain from the Lip Fixation stain. 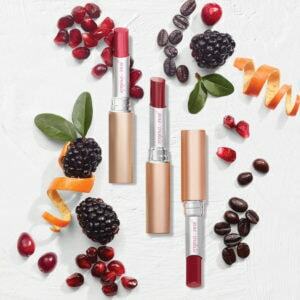 Jane Iredale’s lip options offer a wide variety of color and are jam-packed with amazing ingredients to nourish your lips. One application of any of the lip lines packs so much pigment into your lip and the color is so long-lasting. [/vc_column_text][/vc_column][/vc_row][vc_row][vc_column width=”2/3″][vc_column_text] In the case of the PureMoist line, it’s made with Moringa Oil, which hydrates the lips with Vitamins A & C, while Coffee Seed Extract infuses with even more antioxidant protection. The Lip Fixation has Vitamin for antioxidant protection, as well as Avocado Oil and Ginger Root Extract to calm, protect and provide antimicrobial protection.